As Franklin’s fitness experts, SMARTCore Fitness Method is in a league of its own in helping people achieve better strength, mobility, posture, alignment, and holistic health. But even with our fitness center right around the corner, it can be hard to decide which fitness class is right for your fitness level and your personal needs. In this blog, we’ll outline our fitness classes for you to make the decision to improve your fitness and health easier than ever before. ABSolute Essentials is the best way to start the SMARTCore Fitness Method, giving you a fundamental rundown of all the basic movements and philosophies that drive our fitness programs. No matter your level of fitness, you’ll be able to move at your own pace and see holistic health results from our programs, including improved body alignment, increased mobility, better balance, and a heightened sense of self-awareness. This class is a great place to start in our fitness center, and can provide you with the knowledge and body awareness to continue onto our SMARTCore Open Level class! Led by SMARTCore Fitness Method founder Kaylee Cahoon, the SMARTCore Open Level classes utilize gravity, flow from movement to movement, and a quick pace to deliver a holistic workout that stimulates the body and the mind. Every part of the Open Level class is tailored to your fitness abilities and needs, so you can push your own limits and strive for better mobility, strength, self-awareness, and overall body harmony. In our Pilates Reformer class, the endless benefits of pilates are even more powerful with the use of a traditional “reformer” machine. This machine utilizes straps, blocks, and bars to increase the resistance and intensity of Pilates movements, promote deeper stretching, activate muscle groups and the nervous system, and accelerate the improvement of core strength and stability. The extensive Pilates Reformer expertise of the SMARTCore Instructors combined with small fitness class sizes ensures that your Pilates Reformer experience is effective, safe, challenging, and most of all, fun! A class designed and taught by Advanced Pilates Teacher Trainer, Maggie Parker to challenge and develop your coordination, proprioception, balance, and strength through movement. This class will play with a variety of ‘toys’ such as balls, straps, rollers, and sticks. Come have fun and stimulate new and old brain-body connections! This class is appropriate for people of an intermediate or advanced level of fitness. SMARTCore Yoga takes advantage of the basic principles of yoga, but it isn’t your average yoga studio class. By incorporating SMARTCore Fitness Method philosophies and principles, yoga takes on a form that works the muscles and joints soundly while still providing mental clarity, self-awareness of the body, a sense of peace and relaxation. Lloyd Robinson leads a course that is appropriate for first-timers, aspiring yogis, or expert yoga practitioners, so no matter your yoga skill, you’ll reap all of the benefits of this class. A large majority of health professionals and fitness experts overlook the fascia—or the flexible material that surrounds your muscles and soft tissues—mainly because so much emphasis in the fitness and health world has been placed on the muscular system. But stretching and removing excess fascia through fascial stretching exercises is an excellent way to improve flexibility, posture, and muscular function, as well as promote injury resistance throughout your entire body. This Kaylee Cahoon-led course utilizes gentle, slow stretches to free up long kinetic chains of fascia, so you can feel the effects of fascial stretching at your own pace and give your bones and joints a sense of freedom! For people who experience chronic pain, arthritis, or the physical consequences of obesity or a past injury, it can be incredibly difficult to feel healthy, active, and connected to the body throughout daily life. Kaylee Cahoon has made it her passion to improve the lives of people with these issues, and teach them how to “friend” their bodies through therapeutic fitness exercises. Even if you have a lack of confidence when it comes fitness, or you feel “unfit” for exercise, this class is a perfect place to start improving your flexibility, alignment, posture, fitness, and overall health. If you’re recovering from injury or disease, or experiencing serious problems with your weight, it’s best to talk to your doctor before signing up for SMARTCore Fitness Method Therapeutic Fitness classes. But if your doctor clears you for this kind of activity, you’ll be well on your way to a healthier and happier life. Angie Rile’s Bodies in Motion fitness class is an excellent way to mobilize the spine and shoulders, increase flexibility, improve respiratory and cardiovascular fitness, and up your physical strength so you’re prepared for anything life throws at you. 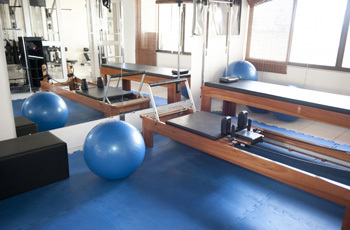 By utilizing yoga balls and sitting benches, spiral, circle, wave, and undulation movements will challenge our core strength, your sense of balance, and your breathing capacity for an all-around killer workout. Plus, the movements in this class are easy and gentle enough that people of any fitness level can participate and achieve optimal fitness results. No matter your fitness needs, SMARTCore Fitness Method has a class that can suit your fitness level, personal goals, and complex schedule. For more information on any of our courses, give us a call—or even better, stop by and try out one of our classes today!